*Bar can NOT rest on ground, in hang, or on shoulders, can only rest locked out overhead less than 3 seconds. He’ll outrun you AND outwork you! Keep it up man! Damian’s been working hard on those Muscle Ups just like everything else he works on. Great athlete and guy that can out run a lifter and out lift a runner. He’s CrossFit! Great work buddy! Damian is a great guy, but a BAD BAD man!!! DC knows one speed, 100 mph. Another RP Superstar! WBS wore me out this morning. A. 15rx- first got 11rx then mad that I let go early. Rested then 15rx. 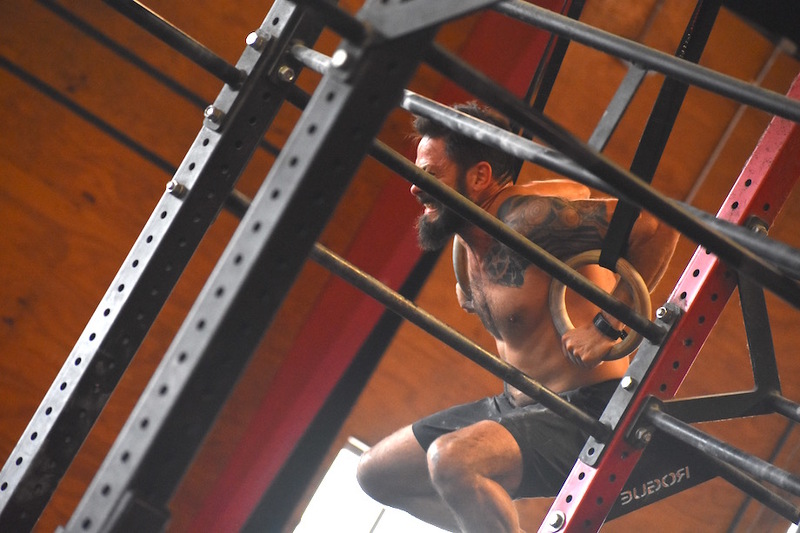 At 3, 2, 1, GO Damian goes full speed, and he doesn’t slow down one bit until the WOD is complete. He’s super nice and a stellar athlete, too! Thank you for the kind words, I love my Crossfit family! My face looked just like this today with all those dang wall balls! Don’t let the beard fool you! Damian is has cool as they get. Just don’t challenge him to a race. I once saw Damian outrun a mustang on the parkway! – Damian is one bad dude! He’s a great athlete, father and friend! Keep rocking it stud!